The Birthday Party were an Australian post-punk band, from 1977 to 1983. Formed in Melbourne, the band were one of the darkest and most challenging post-punk groups to emerge in the early '80s, creating bleak and noisy soundscapes that provided the perfect setting for vocalist Nick Cave's difficult, disturbing stories of religion, violence, and perversity. Their sound drew upon punk, rockabilly, free jazz and the rawest blues, but transcended concise categorization. Under the direction of Cave and guitarist Rowland S. Howard, the band tore through reams of blues and rockabilly licks, spitting out hellacious feedback and noise at an unrelenting pace. As The Birthday Party's career progressed, Cave's vision got darker and the band's songs alternated between dirges and blistering sonic assaults. Originally, the Australian band was called The Boys Next Door, comprising Cave, Howard, Mick Harvey (guitar, drums, organ, piano), bassist Tracy Pew, and drummer Phill Calvert. After the Door Door album and Hee Haw EP under that name, the band moved to London and switched its name to the deceptively benign Birthday Party. Once they arrived in Britain, their demented, knotty post-punk began to gel. They released their first international album, Prayers On Fire, in 1981, earning critical praise in the U.K. and U.S. While the band was preparing to record the follow-up, Pew was jailed for drunk driving; former Magazine member Barry Adamson, Harry Howard, and Chris Walsh filled in for the absent Pew on 1982's Junkyard. 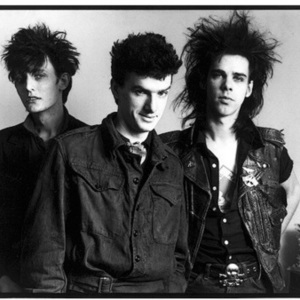 After the release of Junkyard, Calvert joined Psychedelic Furs and the band moved to Germany, where they began collaborating with such experimental post-punk acts as Lydia Lunch and Einst&uuml;rzende Neubauten. Harvey left in the summer of 1983. The group briefly continued with drummer Des Heffner, but it soon disbanded after a final concert in Melbourne, Australia. Cave had the most successful solo career, recording a series of albums in the '80s and '90s that maintained his status as a popular cult figure; Harvey joined Cave's band Nick Cave & The Bad Seeds. Howard joined Crime & the City Solution, which also featured his brother Harry and Harvey. Tracey Pew toured with The Saints before dying of an epileptic seizure in 1986.